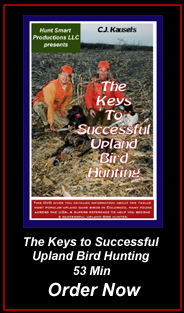 If you are looking for detailed information needed to improve your "Do It Yourself" upland hunting skills or are a novice or youth hunter, this DVD is a must for your library. CJ has condensed many years of "Do It Yourself" upland hunting experience into this 53 minute seminar program. The categories below detail the specific information as it applies to twelve upland species inhabiting Colorado. These same upland birds are found in many other parts of the country, therefore, the information presented will be beneficial to all upland bird hunters.